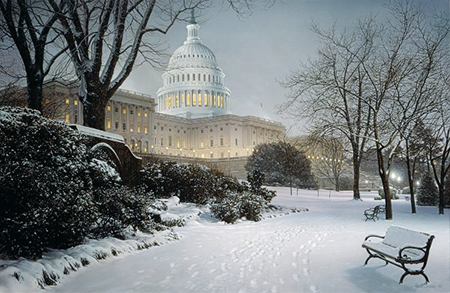 We are offering "Evening on the Hill", a signed and numbered limited print by Rod Chase. The print has never been owned, measures 9" x 12"
Evening on the Hill by Rod Chase ~ Again, Rod Chase has created an elegant, truly amazing, painting of our Capitol. He was attracted to this snowy scene because of the unusual lighting of the structure and the pure serenity of the pathway leading to it. Ask us about other sizes of Evening on the Hill that we may have available.